I’ve been in the art business for over 35 years. And to say it has had its ups and downs might be a bit of an understatement. But nothing could have prepared me for the last ten years. 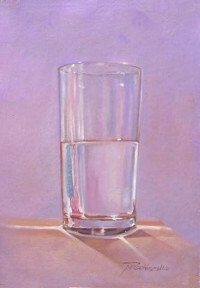 As the middle class has been shrinking dramatically, so have opportunities for mid-level businesses, including artists. Throughout my career, I’ve been very intentional about not making my prices too high for a middle class family to own a nice original piece of art, while not pricing my work so low it would not be taken seriously, i.e. valued. Throughout my career, I’ve made a point to have something for everyone. You can buy my book for $10 and get $1,000 worth of insight. Or you can buy a painting for a $1,000 and get a million dollars worth of pleasure for the rest of your life. Keeping cost equal to value has become a very slippery slope in recent years. The priorities of a sanitized, generic, corporate utopia, created by Walmart, on the backs of the working poor, along with easy access to incredible image technology, artists have been rendered nearly superfluous. I have watched economic polarization raining on the parades of mid-level artists, entrepreneurs and producers, who are getting lost in place. The market for artwork priced between $500 and $5,000 has been shrinking steadily. The most successful corporations primarily target the poor (Walmart) or the wealthy (Rolex). Those catering to the middle are falling by the wayside. Mom and pops are disappearing. One up items, once produced by sincere emerging artists are now either priced so cheap they cannot be taken seriously, even by a hard-working class consumer, who are savvy enough to know when they are being taken for a quick buck. Or, on the other end of the spectrum, upscale consumers are fighting over who can “flip” a Lucien Smith or an Oscar Murillo. For them, the co-modification of art is just a cute game. In the real world, who can afford to sell artwork for $150, which is the most a working class connoisseur of fine art could possibly afford? Talk about starving wages. The American Dream is no longer feasible in America. The ever growing working poor are reminded at every turn that they will never be in the 1%, unless they win the Lotto. And yet we blithely cling to hope, as the disparity between rich and poor grows larger every year. The hard work and progress toward equal opportunity has become a sham. So, what is a hard working artist to do when the markets are fewer and farther between? Like everyone else, we are working harder for less. For me, I have had to diversify into related fields, which has expanded my creative horizons. I have opened markets I didn’t know were there and learned skills which have made me a better person. I have developed new marketing models, such as linking my art with charities, art with a social conscious. While many of these efforts have proven worthwhile and produced many positive results, many have not. A lot of time has been wasted that could have been spent painting. Which leads me to my concluding point: I think, ultimately, being prolific creatively, is still the best kept secret for success. Yes I will get my million dollars worth ever time I look at my reasonable piece I purchased from you and think of your talent and friendship. I hope you, Kate and the kids are well. Michael Davis liked this on Facebook. Will we see you this Saturday Michael Davis? Go for it! Just know what it is you’re going for. Painting pretty pictures is only a part of being a professional artist. But you’re right. This blog is a little dire sounding. My apologies. It’s hard not to feel a little frustrated with all the challenges we face now. Oh no! I wasn’t digging at the tone of the writing. Its frustrating enough and I don’t even have to depend on it. Just fishing for advice. Thanks!! oh, in that case: my advice is get really awesome and study and learn a lot before cutting to the chase and grabbing onto a style and hitting the market, where the pressure to conform or come up with a pony trick is very strong. Find your voice by searching inside and outside your self, rather than finding what works today and building your career around that. Wesley Israel liked this on Facebook. Marion Fowler liked this on Facebook. Adriana Carter liked this on Facebook.